Completed in 2005, the Meridian Crescent condominiums enjoy a prime piece of Adams Morgan territory. Located at 2200 17th Street at the corner of Crescent Place in Washington DC’s 20009 zip code, this four story structure is home to just 29 luxury residences. The building is right between Meridian Hill Park and 18th Street—the latter being the site of so many popular restaurants and retail boutiques. This is an area that has seen a lot of construction in recent years. But rather than going the full modernist route, the developers of this boutique building chose a fairly traditional brick row house look with sculpted cornice trim augmented by more contemporary accents, such as giant floor-to-ceiling windows. Condos for sale at Meridian Crescent include one-bedroom flats and two-story penthouses with two bedrooms and a den. Floor plans are unusually spacious, ranging from 1,284 t0 2,041 square feet. Some units have balconies and all condos have high-quality finishes and full-sized washing machines and dryers. The floor plans are contemporary and open without hewing to industrial-chic trends, with high ceilings, beautiful Brazilian cherry hardwood floors and gourmet kitchens with granite counters, GE Profile appliances and maple cabinets. The elegant bathrooms feature super-long limestone vanities, Kohler fixtures and huge frameless showers. Condos for sale don’t pop u p too often here, given their relatively small number. But when they do, prices generally start in the mid-$500’s and climb to over a million dollars. 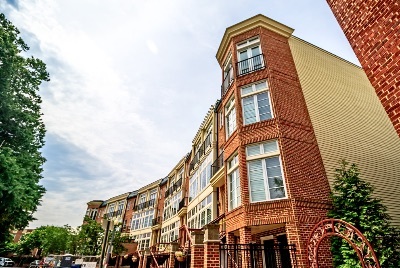 This pet-friendly building is within easy walking distance of the new Harris Teeter, as well as the historic urban structured park from which it gets part of its name. Meridian Hill Park is well known for its terraced waterfalls, statues and community gatherings. And as mentioned earlier, there’s also all the fabulous bars, eateries and coffee shops along 18th Street, just one block to the west. 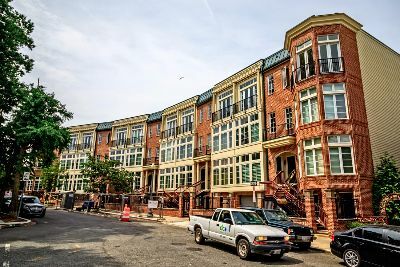 You’ll also find a number of other recently built boutique condominiums in immediate area, including the Lofts at Adams Morgan, 1700 Kalorama Lofts and Adams Row, as well as renovated antique classic like 1661 Crescent Place. The Meridian Crescent is situated an equal distance between the Adams Morgan/Woodley Park-Zoo and U Street Metro station. Secure garage parking is also available. Roll out your car or hop on a bike—next-door 16th Street is a straight shot right into the heart of Downtown.